Former Apple and NeXT graphic designer Susan Kare took the stand on Tuesday, saying that she saw "substantial simiarities" between Samsung's home screen icons and those of Apple's iPhone, echoing previous testimony from Apple expert witness Peter Bressler. Kare, a designer credited with many of the original Mac's icons including "happy Mac," gave her testimony as an Apple expert witness at the Apple v. Samsung patent trial, noting several elements of Samsung's UI infringes on the look of Apple's iPhone home screen, reports The Wall Street Journal. In making her comparisons, Kare studied home screen icons on 11 Samsung smartphones released after the original iPhone debuted in 2007, including the "Captivate" and "Galaxy S 4G." Among the icons studied were Contacts, Notes, Photos and Settings, which were compared to counterpart assets on Samsung devices. In addition, the grid-type layout of the iPhone's home screen is also allegedly infringed upon by Samsung's designs. Apple owns patents regarding the look and layout of icons in iOS, as seen in the company's D'305 patent which was filed for in 2007 and granted in 2009. According to testimony, the two companies' iconography was similar enough that Kare herself became confused at one point and mistook a Samsung handset for an iPhone. "I mistook one for the other," Kare said. "In addition to the analysis, I personally had the experience of being confused." 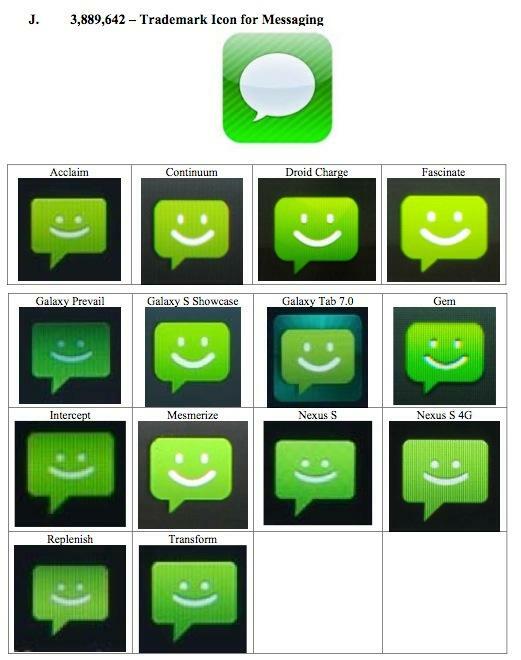 Samsung countered by presenting the icon design of the messaging app featured in Samsung's "Fascinate" smartphone, an example which does not share the iPhone's rounded-square imagery. Kare agreed the specific designs are not "substantially similar" to Apple's assets, but noted the two shared the same metaphors. "it's not 100% different," Kare said of the "Settings" icons. Apple's take displays a set of three gears while Samsung's presents one large gear. Apple exhibit comparing Samsung messaging icons with the iOS Messages app. Kare said that in her search for design alternatives, she found examples which "show you can do a design that doesn't look confusingly similar," referencing a UI solution from RIM. The argument of confusion is at the heart of Apple's case against Samsung and has been repeated numerous times over the course of the proceedings. In Samsung's defense, lawyer Charles Verhoeven argued that by simply turning on one of the handsets, any customer would see the difference between an iPhone and one made by the South Korean electronics giant. To illustrate his point, Verhoeven turned on three devices to show their respective boot sequences. On startup, Samsung's Android-based "Charge" smartphone displayed a company logo followed by a brief Droid animation, while Apple's iPhone displayed the Cupertino company's metallic logo. Verhoeven went on to explain that a Charge user needs to boot the device, unlock it and press a button to reach the home screen. Apple v. Samsung will resume on Friday with testimony from Apple expert witnesses.